Heart Thief’s cover was my first “single element” cover with no person/people on the front. I think this was supposed to indicate a classier book or something. I first heard about it when on a trip in England and I got the news from my new agent. I’d met Jayne Castle/Jayne Ann Krentz the year before at the Berkley publisher party and graciously gave me the cover quote (which you may or may not be able to read). 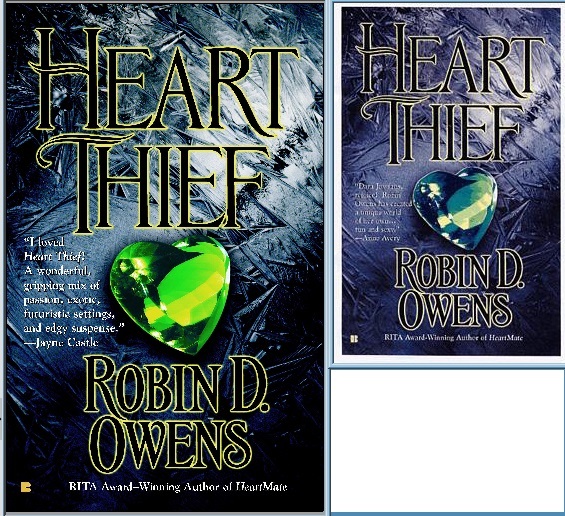 Since the cover is metallic, it was extremely hard to photograph or draw or whatever…so I have the bright green heart (which I don’t care for) and the toned down green. The book is about outlaw/thief/Null Ruis Elder and SupremeJudge Ailim D’SilverFir, both of whom have problems. I rewrote the beginning of this book several times since first it was a fantasy with romance, then when HeartMate didn’t sell fast, I joined a fantasy critique group and rewrote it, then when HeartMate sold, I rewrote it to up the romance. I also had a “Captain’s Log” at the beginning of each chapter, of the story of Nuada’s Sword’s Captain, Kelse Bountry and the last days in space of that starship. I never mastered this technique because I wanted the Log to rather reflect Ruis’ story in some fashion and then I’d change the chapter…I still cringe at the amount of work I did on that. I think I have 3-4 versions of all of the “Captain’s Logs”…somewhere. The story eventually became Heart and Sword, the first story of that collection (Hearts and Swords).